Check out the latest Three Panel Soul! A company that makes advertising products, uses the UN SPACY logo as their logo here in Mexico. I guess the owner is a huge fan of macross or something like that, because is a very large company. first I lol'ed at "japanimation" then i raged at "robotech_frame.jpg"
No, this was not taken in the 90's; this was taken just last friday. This is from a fast-food chain, and that's their equivalent of a McDonald's Happy Meal. buyt them and resell at high prices. What chain is that? What bizarre demographic do you live in? Note name in center, below bee, and above happy meal. No way, et tu Jollibee? It's a fast food restaurant based in the Philippines. It's in America too, even one in my town. I better check just in case. Weird, never heard of it. Took a look @ their site... The "Heavyweight Yumburger" sounds irresistible. What?? No way?? I was just in the Philippines a few weeks ago and never saw this. 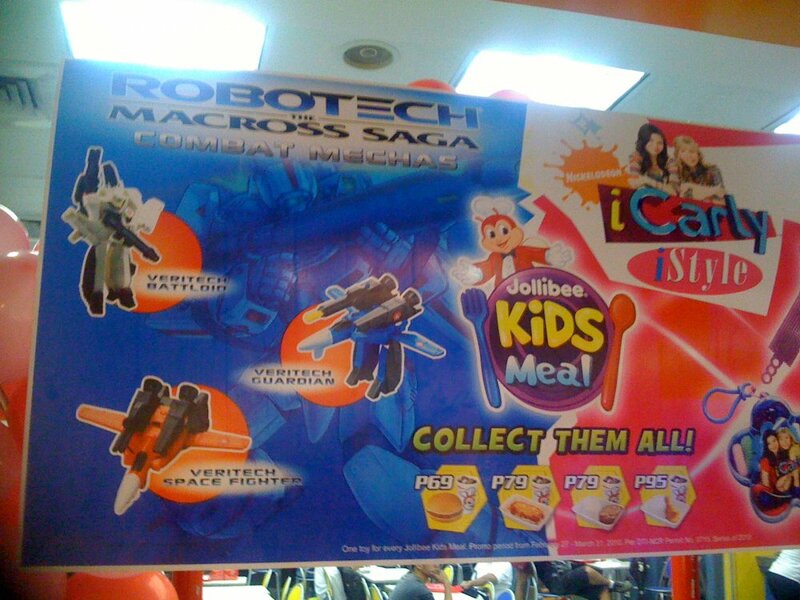 Not like I'd get it because it's Robotech, but might have enticed me to try the kiddie meals in addition to the various breakfast offerings. Might be a new promo. I only saw it the first time over the weekend. This is one for all you who are able to get the BBC's Eastenders. In Ian Beal's Cafe there is an arcade machine. on said machine is the Macross scrolling shooter from the 80's. its been in the show for years and you can often see it, most notably when the Tuna head screen is showing. I wonder if they know its worth. Oddly recently there was a fire/explosion in the Cafe, I feared the worse, but after it rebuild the only original thing is the arcade machine. 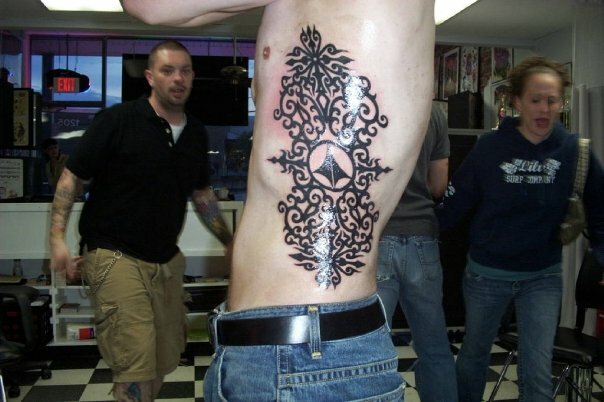 Cant find a picture of it but its there. I was watching Andrew Zimmern eat strange things on the Travel Channel, and in this particular episode they played the song Yanyan from Macross Zero's OST 2 in the background. It made me happy, but sort of freaked out. Also, this really has very little (nothing at all) to do with Macross but since it's kind of sci-fi or whatever... I was watching The Milla Jovovich movie The Fourth Kind and it all takes place in a village called Nome, Alaska. That's about it for my Macross related sightings. When I recently visited Manila, I went into a car accessories shop called Blade and they were playing an acoustic version of "Totsugeki Love Heart." And when I went to Hong Kong last year, an electronics store was playing "What 'bout My Star? (@ Folmo)". Damn! I never watched Eastenders, but if I'd known that 6 years ago when I lived in London, I would've raided the set in search of that machine! Good to hear it's still there. Great find! Aside from MAME (which doesn't count, and still has no sound emulation anyway) I've only ever played it in an Akihabara game centre once in 2001, and it's long gone now. Dude, is that the Blade shop the one in Robinson's mall Metroeast (cainta/pasig)? Coz I heard the exact same thing! If you heard it from the exact same shop, then that means one of the personnel there is probably a fan (much to the chagrin of everyone else, i presume). But if you heard it from another branch, then the owner is most likely a fan, and he's ordering everyone to "PLAY TOTSUGEKI LOVE HEART ALL THE TIME OR I'LL FIRE YOU, YOU BASTARDS. BOMBA!!!" It was at Greenbelt I in Makati. AHA! It's official! We have a chain of stores owned by a Fire Bomber fanatic. BOMBA!! Location:a green cucumber shaped giant ship heading towards Earth. 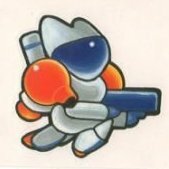 Club atom's icon is simular to the macross kite. all its missing is the tail part. oh well, I did see a huge pile of macross and gundam models in a clothing store in ueno. kinda odd but not wierd compared to the rest of japan. Kinda related: I saw a bunch of, believe it or not, Southern Cross models (ATAC Armor: Bowie, Adrzej, and Charles) at a CD in Kita Senju a couple of years ago. ...Aside from MAME (which doesn't count, and still has no sound emulation anyway) I've only ever played it in an Akihabara game centre once in 2001, and it's long gone now. Au contrere, mon frere! Sound in SDF Macross has been supported in MAME for years now. Oh man, nice eye! I never caught that little reference! Can anyone confirm this, but I could have sworn I saw her in a commercial for some type of bank a few months ago.